Product prices and availability are accurate as of 2019-04-13 07:24:07 EDT and are subject to change. Any price and availability information displayed on http://www.amazon.com/ at the time of purchase will apply to the purchase of this product. 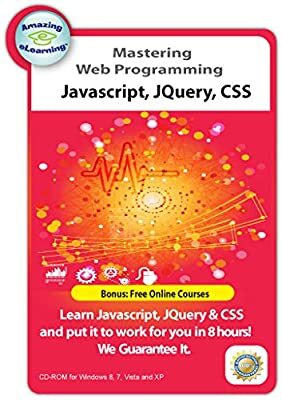 Mastering Web Programming and Style Design Course is a must have step-by-step narrated training for first time beginners. The tutorial is divided into five modules. The third module is to teach you how to use JQuery to manipulate the DOM. The fourth module is to teach you how to use the Cascade Style sheets (CSS). The final module is for you to refresh the basic HTML Elements and tags. This step-by-step narration explains the web programming, then helps you apply those skills directly and immediately to your own projects.